Adam Hanga of Baskonia Vitoria Gasteiz has long been building his reputation as an elite defender and now the head coaches from the Turkish Airlines EuroLeague have voted him as the best. EuroLeague Basketball is pleased to announce that Hanga has been chosen as the winner of the Best Defender Trophy award for the 2016-17 season. Baskonia had one of the highest-scoring offenses in the competition this season, but that was also a product of the work done on the defensive end. It was the type of the effort put forth by Hanga that allowed Baskonia to pad the scoresheet with easy transition baskets. Hanga produced the league’s fifth-most steals this season, led his team in blocked shots and was responsible for countless other defensive stops. The versatile small forward was often in charge of the opposition’s top scorer and used his ability to stop penetrations and get opposing players off their rhythm. His energy, help defense and quickness to adjust and recover were all along the many reasons coaches voted for him to become the first Baskonia player to win the Best Defender Trophy. Fenerbahce Istanbul big man Ekpe Udoh was the runner-up to Hanga in the voting. Hanga placed third in the voting for the same award last season. The first of this season’s Euroleague awards was announced Monday when Keith Langford of Unics Kazan was named winner of this season’s Alphonso Ford Top Scorer Trophy. Others to be announced in the coming days include the Euroleague Rising Star Trophy and the All-Euroleague honorees. The MVP award will be revealed at the Turkish Airlines Euroleague Awards Ceremony on Thursday, May 18 in Istanbul. The Alexander Gomelskiy Coach of the Year Trophy and the Euroleague Club Executive of the Year are post-season awards. In his third EuroLeague season, all of which have been with Baskonia, Hanga produced such a tremendous defensive effort that opposing coaches and players were forced to take notice. He tied for the team lead in steals with 1.3 per game and his total of 42 thefts were tied for the fifth most in all of the EuroLeague. Hanga also paced the team with 22 blocked shots and was second in defensive rebounds with 3.5 per game. Each time Hanga ended the opponent’s attack with a steal, block or rebound, it created another opportunity for Baskonia to push the ball and get transition baskets. Moreover, he stood out as the only player with more than 20 blocked shots who did not play either the center or power forward positions. He played a key role in Baskonia holding opposing teams to the third-lowest two-point shooting percentage (49.0%) in the regular season. His contributions helped steer Baskonia into the playoffs, where it put up a great fight before falling to CSKA Moscow in three tight contests. 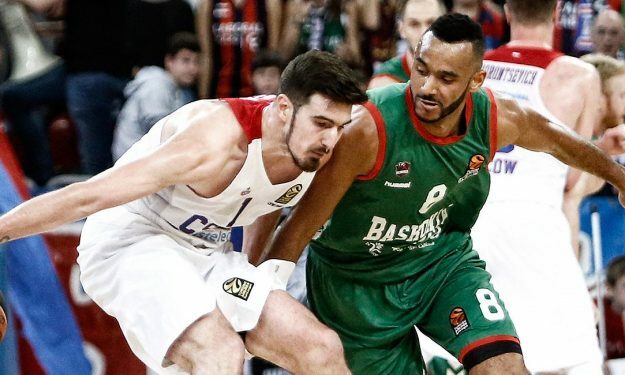 Hanga becomes both the first Baskonia player and first Hungarian player to win the award. Hanga started his professional career with Albacomp in his native country, before moving to Spanish side Manresa in 2011. He joined Baskonia two summers later, and made his EuroLeague debut with the club in the 2013-14 season. After spending most of the following campaign on loan with Italian side Avellino, Hanga returned to Baskonia, where he turned into a key piece of the puzzle for a team that reached the 2016 EuroLeague Final Four and the playoffs this season. Hanga is only the seventh player to win the Best Defender Trophy award since its inception in 2004. He joins six-time winner Dimitris Diamantidis (2005, 2006, 2007, 2008, 2009, 2011) and Stephane Lasme (2013) of Panathinaikos Athens; Victor Khryapa (2010), Andrei Kirilenko (2012) and Kyle Hines (2016) of CSKA Moscow; and Bryant Dunston (2014 and 2015), who won the award in consecutive seasons while playing for Olympiacos Piraeus.